ROBERT BRAY was the son of the beast jobber George Bray. He was born in Caistor in Lincolnshire c.1813. His mother was Catherine Newell. We do not know the full number of Robert’s siblings, but he had a younger brother George. Robert became a horse dealer and George junior a cattle dealer. SOPHIA BONES was born about fifteen miles away, in the Lincolnshire village of Broughton, near Scunthorpe, on 13 April 1817. She was the child of a labourer Robert Bones and Mary Dent. She was christened in Broughton-by-Brigg on 20 April 1817. Sophia was the eldest of eight children. Robert Bray and Sophia Bones were married in Broughton on 7 June 1838. A month later their son George was baptised a few miles away, at Barrow upon Humber, on 27 July 1838. It would appear that baby George died in infancy. A daughter Mary was born in the latter part of 1840. In the 1841 census we find the following household. It is very probable that the cattle dealer George Bray is Robert’s brother. The two young couples are sharing a house. Messingham is 3 miles south of Scunthorpe., and 11 miles west of Barnetby le Wold, where we find Robert and Sophia later. They settled down at Barnetby-Le-Wold, east of Brigg, where at least another four children were born between 1843 and 1855. Robert on 5 August 1846. In 1848 Robert was listed as a horse dealer in Kelly’s Directory for Barnetby le Wold. Robert is again listed as a horse dealer in the 1851 census. 1851 census. Barnetby le Wold. Their fifth child, William, was also born at Barnetby, in 1853 and Henry (Harry) on 10 May 1855. Robert is again listed as a horse dealer in the 1855 Post Office Directory for Barnetby and in White’s Directory of 1856. In the 1861 census they were still living at Barnetby le Wold. The family remained there for the birth of the youngest child, Tom, around 1862. Their grandchild Sophia was also born at Barnetby le Wold around 1870. But by 1872 the Gazeteer and Directory of Lincolnshire has no Brays listed in either Barnetby or Broughton. There is a Thomas Bray, horse dealer, at 15 Bigby Road, Brigg, and a Thomas Bray, cattle dealer, at 10 Bigby Road, Brigg. It was around 1870-1 that Robert, Sophia and their family moved a considerable distance to North Yorkshire. In the 1871 census they are living at Sutton Grange, in the ecclesiastical parish of North Stainley. This is a couple of miles north-west of Ripon, and some 60 miles from Barnetby le Wold. Three of their sons are with them, but no daughters. The agricultural labourer George Whelpton seems to have travelled with them from Lincolnshire. Henry is 15 but still at school, when others boys of his age might be expected to have started work. 1871 Census. Sutton Grange, North Stainley. Robert does not appear in the 1871 register of land owners in the North Riding, so they appear to have been tenant farmers. They moved a little further north, to South Cote Farm, near Masham, on the eastern edge of the Pennines. In 1881 this was a 220 acre farm employing three men. In 1875 Robert was in dispute with one of his farm apprentices. York Herald. Thursday 7th January 1875. Before Mr E. R. Turner, Judge. AN INJURED FARM SERVANT GOING HOME WITHOUT PERMISSION. The only case of interest at the Court House yesterday, was one in which William Carver a boy aged 13 years, of Sowerby, near Thirsk, sued his late Master, Robert Bray, farmer, of Southcote near Masham, for £12 wages due and £2 16s board and lodgings for eight weeks. Mr Richardson, of Thirsk, appeared for the plaintiff, and Mr A West of Bridlington, for the defendant. From the evidence tendered it appeared that the boy had been hired at Martinmas 1873, for a year’s service in husbandry at £12 wages. He worked for nearly 10 months, but in September last had the misfortune to break his arm while attending to his master’s business. He was returning to the harvest field with an empty cart for another load of corn, and while he was driving the horse, the shelvings of the cart upset, and he was thrown to the ground, one of the wheels of the cart passing over his arm and breaking it. Acting under the defendant’s instructions he then went to Mr Horsfall, surgeon, of Masham, who set the limb. The lad at once returned to Mr Bray’s, and after remaining nearly a week, went to his Mother’s home and stayed there for seven weeks. On his arm being restored at the end of the latter period he went back to his master, who declined to receive him, and said that he had gone away for his own pleasure and without leave; he must now remain away and forfeit his wages. The master would thus neither have the boy back nor pay him his year’s wages, for which, and the cost of the recovery of the cost of the lad’s keep while he was at home, the action was now brought. The defendant endeavoured to show that plaintiff had no business on the cart at the time of the accident, which it was alleged he had caused by his own recklessness. He, however, admitted that he saw the lad on the cart, and merely told him not to fetch another load. This injunction was not disobeyed, for it was while returning with the empty cart that the accident occurred. Under these circumstances his Honour decided that the boy was injured while fulfilling his proper duty, or at least he was not acting contrary to his master’s wishes. The defendant was “surprised to learn,” and also annoyed at the revelation, that he would be obliged to pay the doctor’s fees, as he had ordered the lad to go to Mr Horsfall. The only question now was as to the dismissal of the plaintiff. On the defendant being called as a witness (plaintiff not being present), he said that Carver went home when he might have been useful, and when he (the master) asked him to stay, and told him that if he did not he would not be allowed to return. His Honour cross-questioned defendant as to the use a boy could be with a broken arm and ascertained that the lad actually did remain in defendant’s service for nearly a week after the accident, and that he then went contrary to orders, and when not recommended by the medical gentleman. The Judge said that fact put a very different complexion upon the whole case. The plaintiff was clearly not justified in claiming wages for the weeks subsequent to the time when he himself went away; and therefore the defendant would surely have to pay him for the 10 months which he actually worked, and that out of that £10 he might deduct the doctor’s bill, £1 12s 6d, which he was bound by law to pay. After his Honour had given this decision it transpired that the defendant had already paid £8 5s into Court. This was held to be quite sufficient, after the medical expenses had been paid, and defendant’s costs and those of his attorney were ordered to be deducted from the £8 5s – A somewhat singular circumstance connected with this case is that the plaintiff had a brother in defendant’s employ, and he was also incapacitated by accident. His case however was compromised out of Court. Robert died at the farm on 10 February 1880, of bronchitis, followed by congestion of the lungs. He was 66. Sophia took over the farm. She was there in the 1881 census, with her sons Henry and Tom. There was also her son-in-law, George Good, and some grandchildren, although her daughter had died. Given the dates and the farm location, TB must have been a possibility. Kate Harland was the child of the servant Mary Harland. She is said here to be Sophia’s granddaughter. Her father was probably Sophia’s son Henry, who married her in 1881, shortly after this census. There was no way of knowing whether the relationship between Mary and Henry was consensual, or whether the farmer’s son took advantage of the teenage employee. Robert and Sophia’s daughter Sarah Ann married another farmer, Jabez Maplethorpe of New Zealand Farm, North Stainley. In 1877 the farm was the site of a suspected outbreak of cattle plague. York Herald, Sat 28 April 1877. Alleged outbreak of cattle plague – Our Ripon correspondent says an outbreak of what is alleged to be cattle plague, occurred at North Stainley, on Thursday, a beast, the property of Mr Jabez Maplethorpe, of New Zealand Farm, having been found suffering from the disease. The animal was at once slaughtered, and every possible means was taken to prevent the other stock from being infected. It proved to be a false alarm. The reported outbreak near Ripon – We are glad to be able to state, from enquiries we have made, that the reported outbreak of cattle plague at North Stainley, on the farm of Mr Jabez Maplethorpe, turns out to be incorrect. The error, a serious one, above from the fact that a beast was suffering from pleura-pneumonia, and was slaughtered. In 1880, the Maplethorpes were again in the news. York Herald, Sat, Nov 20 1880..
At the instance of the School Attendance Committee of the Ripon Union, the following persons were summoned for neglecting to send their children to school, and an order was made in each case for their regular attendance:- Jabez Maplethorpe, New Zealand, North Stainley. Thomas Wood, Kirby Malzeard. Joseph Jackson, Grewelthorpe. Bartholomew Rock, Mickley. John Cartman, Azerley. Thomas Gill, Azerley. Charles Bonwell, Kirby Malzeard. Henry and Mary stayed to help Sophia on the farm through the 1880s, but South Cote was empty at the 1891 census. The family have not been found elsewhere. By the 1901 census Sophia, with her son Tom and his family, had moved across the Pennines to Saltaire, on the outskirts of Shipley. Tom had left farm work to become a navvy. Sir Titus Salt was a leading millowner in the woollen industry. He moved his enterprise from Bradford to Shipley and built a large textile mill and model village beside the River Aire, the Leeds and Liverpool canal and the railway. The name is an amalgamation of his own surname and the River Aire. He built good quality houses for his workers, wash-houses with tap water, bath-houses, a hospital, an institute for recreation and education with a library, a reading-room, a concert hall, billiard room, science laboratory a gymnasium and a chapel which has been described as a “Cathedral of Congregationalism”. The village had a school for the children of the workers, almshouses, allotments, a park and a boathouse. 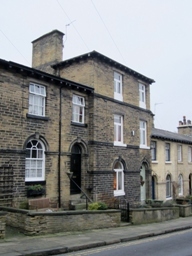 Harry and Mary settled in the village of Earby in West Yorkshire, close to the Lancashire border. Sophia died there in the same year as the census. She may have been there on a visit, or gone to live with them for the last months of her life. Her grandchildren remembered her as always singing hymns. Sophia died on 8 November 1901 in Earby, Yorkshire. She was 84. She was buried at Thornton-in-Craven. Their son Robert came with them to Yorkshire, but returned to Lincolnshire. He married Jane, who was born in Barnetby c. 1850. The 1881 census has him living with four children at Star Carr Lane, Wrawby, Lincolnshire. He is a farmer with ten acres. Their eldest daughter, like Jane, was born in Barnetby, but the two middle children at Southcote, Masham, around 1871-4. The youngest child was born at Wrawby around 1876, so it is likely they had recently moved there. The son George married Emma, who was born in Holton Le Clay c. 1834. The 1872 Gazeteer and Directory of Lincolnshire has George Bray, bricklayer, living at 21 West Street, Winterton. There is also a Matthew Bray, bricklayer at number 22. In the 1881 census, George, aged 42, is living with Emma and four children at Earl’s Gate, Winterton, Lincolnshire. He is then a builder, employing two men. Genealogical information from Mark Priestley, Jean Etheridge, and online censuses.